I'm back to the Indiamike forum. I exchanged a few messages with some nice travellers on here last year as I was to go on my first trip to India. Unfortunately, I had to cancel it and to postpone it to this next winter (2004-2005). But the good news is that I'll be able to spend several months in India this winter instead of the few weeks I initially wanted to spend last winter. Anyway, I'm currently preparing everything for my first trip to India. A few months that will mostly be spent in Rajasthan, Kerala and Tamil Nadu, between November and January. My travel will be mostly by train between the cities and towns, but I'm currently hesitating between AC class and non-AC "sleeper class". I have to specify that most of my train journeys will be fairly short (a few hours) and by day. I'm currently leaning towards the non-AC class, because of the better view and the ability to see more "real India" rather than tourists. At the same time, I'm wondering whether I might suffer from an uncomfortable heat, even though climate charts suggest it would be ok. The fact is that I'm perfectly ok with daytime temperatures like 20 to 30 degrees, but I'm not too comfortable when temperatures get over 30-35 degrees. Could someone tell me about the kind of temperatures I should expect inside the non-AC class in trains within Rajasthan, Kerala and Tamil Nadu between November and January ? Could you also tell me about some other possible problemes I might expect to have in non-AC class or some real advantages that AC class has (other than the AC itself) ? Based on the time you are travelling, and that you are taking mostly short daytime trains, you should be OK. It will be warm, but not overwhelmingly so. As far as having more of a "tourist experience" I wouldnt really worry about it, most middle class Indians prefer the A/C class as well. 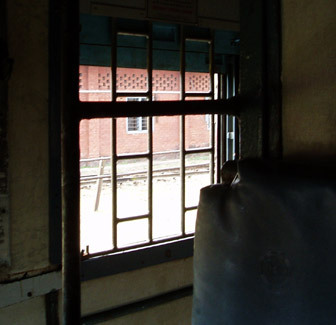 The sleeper class only applies to night travel, during the day, the cabin has more passengers. If you want more space go with A/C. If you do take overnight trains, make sure you get a two-tier as opposed to three tier. The three-tier can be pretty claustrophobic. I would also reccomend the A/C for overnight trips. If you do feel crowded, or hot, another option for short trips is A/C Chair car. This is a bus/airline type seating arrangement. It is only available in A/C class, and not on all routes. Could you tell me more about the difference when it comes to the view between non-AC class and AC class ? I've read that AC class has small, tinted glass windows that can be quite dirty, which might be a drawback, as many of the train journeys I will make are said to be very scenic. Does non-AC class always have barred windows ? Being an amateur photographer, I was thining of possibly taking some shots during some slow scenic train journeys. Would non-AC class be better than AC-class from this point of view ? How large is the space between window bars ? | You look, No Problem! I can't really answer your question of AC vs. non AC as I only ever traveled overnight for longish distances and had AC 2 and 3 Trier. But as you're a photographer and all. It dosn't matter if you can look out the window. The best place for photos is to open the train door, hang on safe and tight and shoot pictures without a window inbetween you and India. I only ever took pics from the train that way. I know that windows can't be opened in AC class. But can the train doors be opened without any problem both in non-AC and in AC classes ? A/C windows are useless for taking pictures. The bars in non-A/C are OK, but as everyone else said, the doors are the best place for pictures. And I have yet to meet a train where you couldn't open the doors. Food is only included in 1st AC fares on special trains, like Rajdhani Expresses and a few other selected trains.. otherwise it works just like in AC 2 tier, buy off the platform or the onboard food serving guy when he comes to take your lunch/dinner order. .... yep, A/C has a definite 'view' problem but can be a real 'treat' for sheer travel comfort on those trips where you 'just want to get there'... no matter how. Another alternative is just straight non A/C 1st if you're feeling hassled. Much depends on you state of mind - I've had times where I've enjoyed 48hr 2nd sleeper journeys with all the coming and going - and on other occasions I've been SO glad I took an 'upgrade' as I may have been very tired etc. The great thing - there's so much choice ! You may also find each route may dictate what's available anyway - with some classes booked / not in service etc. Trains around India! sight... i've many nice memories on that journeys. I've been travelling around India on monzoon season and during fall/winter also. I've always travelled in non-AC sleeper class and I haven't had any problem with the hot, except some day journeys in Rajasthan on august. Even in short journeys i've been in rough II class and, when the train was not really full, it has been a nice experience, tought the seats are not quite comfortable. All the SL coaches I've ever seen had always barred windows but as it's said here you can go and sit in the doors or even you can take pictures trougth the bars, I could do it with a Canon EOS 300 with 300mm focus. I can't give you any information about AC coaches but from the outside some windows seems so dirty to have a clear view. What's so tiring in non-AC class ? What makes this non-AC class more tiring than AC-class ? Is it the heat or something else ? What I mean is the sheer human traffic, combined with heat, dust, noise, etc, might be a little bit too much if you weren't prepared for it. I love it, but others may opt for something a little less congested.. and er... full on... anyone else care to explain why sleeper class can be "tiring"? Non ac sleeper class for day trip is not advisable even for a short distance if you are travelling in a popular / tourist route. There is every possibility that it will be over crowded.Sometimes it gets difficult to sit too even though you have reservation. In some routes (specially in Bihar/Jharkhand etc,) even the corridor/passages , toilets are blocked/ crouded with people.These does not happens in AC class atleast. There are certain routes on all over India where Daily Passengers (students / office goers / locals) take/commutes for certain stretches on particular trains . ( Generally day trains & for 3-6 hours ).If your journey /trip happens to fall on these route then you will be in problem . These people (have no reservation ) always take the sleeper class (though not allowed to travel on this class ) & not the general IIclass (which is meant for them ).This is a very big hassel & that is why more & more people (middle class with family ) are opting for AC in India. I dont know the exact situation about Rajasthan / South India but it is horrible in the eastern part of the country.Better go for Chair Car (CC) or simple non ac First Class (FC) . "If you smile at me I will understand, because that is something everyone everywhere does in the same language"
I done a long thread about Sleeper Class, click on the link below. Air-conditioned v non air con. I agree with butterball, it depends on your mood. I prefer SL class, but as I was buying a ticket to go to Gujarat from Calcutta I changed my mind at the last minute and booked in 3A, I don't even know why, another time I paid for a ticket in air conditioned Chair class, and sat the entire journey in 2nd class. The biggest problem with SL & FC is extra people getting on the train during the day, I always try to get a side berth when travelling by SL class, they are 2 single seats (facing each other), so nobody else can get on your seat. A problem with SL side berths is that your bed is only about 5 foot 6 inches. I think 3A or FC are great options for long journeys and SL for short journeys. In AC classes the coach attendant will most likely stop you sitting with the door open, just smile, close the door, go back to your seat then try another door 5 minutes later. During the day you can walk from your AC coach through to the SL coaches and sit by a door. There are still lots of FC carriages in Rajasthan, Kerala and Tamil Nadu, try to use them, they are fantastic value for money. 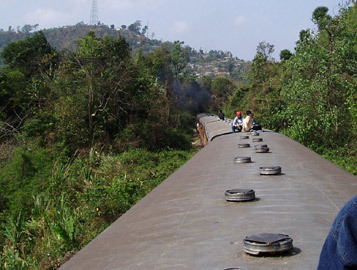 Roof class is perfect for Photography, if you look out of the train and see people sitting on the roof, wait till the train stops and use the ladder at the end of the carriage, I've only managed this in Assam though.